Full Tilt was founded in 2004; it’s now owned by the Amaya Group, the same company that owns PokerStars. It’s licensed in both the Isle of Man and Malta. Full Tilt’s headquarters are in Dublin, Ireland. Its websites are fulltilt.com and fulltilt.eu. Full Tilt’s software has always been its strong point, saying that these days other poker sites have caught up in terms of features. However, its ease of use and visual appeal is still arguably the best out there and just the way everything seems to work so intuitively and slickly. Features include resizable tables, from dimensions of 488×364 up to the size of the screen. The ability to tile, cascade or stack tables via any table. The FullTilt poker site is not available in all countries. The U.S.A. is not supported and neither is Spain. If you are from a restricted country and go to the FT site you will be redirected to PokerStars. You can deposit from $10 using Visa and MasterCard credit cards, Neteller, Ukash, Skrill, PaysafeCard, EntroPay and local bank transfer. Other methods may be available depending on your country of residence. Once you have successfully deposited money to your Full Tilt account, you can choose to use the Single Click Deposits option. 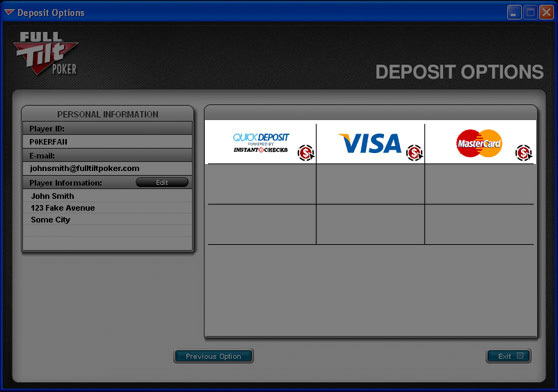 Simply click on “Cashier” in the top navigation bar of the Poker Lobby and then click on “Single Click Preferences”. After briefly reestablishing itself as the number two site following PokerStars takeover of it, Full Tilt is currently sitting in sixth place for player volume, seventh if you count Pokerstars.it, according to Pokerscout.com’s listings. Granted there’s not much difference in player volume between it and its nearest rivals PartyPoker, iPoker, Bodog and 888Poker who lie in the positions above it, but still it’s quite a dramatic change. I think perhaps one of the reasons for its decline might lie with its association with Pokerstars. Although its software is different and its offices are located in Dublin, Ireland as opposed to PokerStars which has its base of operations in the Isle of Man, there’s that nagging, perhaps even subconscious feeling that Full Tilt is now PokerStars B. Perhaps this doesn’t sit easy with those of us who preferred the Full Tilt experience over PokerStars and other sites for whatever reason. I checked this site out at off-peak time, from 10 a.m. to 2 p.m. CET. The good news is that there was plenty of micro and low limit no limit hold em cash games running. I first joined a $.01/$.02 micro full ring game, and it was a relief to find the play was soft, people playing loose passive as you would hope to find at this level. The lower stake games were softer as you might expect but didn’t get that much tougher as you rose in stakes until you reach the $.50/$1. I did the same thing for PLO, which was the softer of the two options with some horrible decision-making happening. On a negative note, the games are more aggressive than they used to be in the past with hands almost always starting with a raise preflop which indicates players have indeed improved at the micro and low stakes. However, in saying that, the games were fairly soft up to the $.25/$.50 level. Players knew how to play poker and beyond a few players who were playing very loose aggressive they were doing nothing horribly wrong. Nevertheless, there was still too much limping and calling raises preflop, and overly obvious bet sizing that gives away the strength of their hands. All the no limit hold’em games tightened up considerably post flop. I finished my no limit hold em testing with a shallow stack $.50/$1game, here there was a noticeable difference. Every hand preflop was opened with a raise and sometimes there was a 3-bet, I think only an expert player would have an edge in this game and I can only extrapolate that any higher level games would be the same or even tougher. My verdict on the low stakes games is that while it’s far from a license to print money, nevertheless the games are easily beatable by a solid poker player. Pot Limit Omaha was softer primarily because it’s a game that offers more opportunities to make mistakes. I then decided to check out some hyper sngs. The standard in the 6-max games was generally good, most tables did have one slightly weaker player though, with some min raising with hands that would have been better shoving. I also played some low limit heads up hypers, a game I have recently been working on, and I was not that impressed with the opposition. My one concern for these hyper sngs are the fees at the low levels, while for the most part the fees are lower than PokerStars tournament fees at the medium levels, they are higher at the micro and lower buy-ins. One of the best things about Full Tilt is you can get double or even triple Full Tilt Points for some games at Off peak times, known as Happy Hour. There are limitations on these points these are only available for some ring games and Sit N Gos and points earned can’t be used towards other promotions. Verdict: While my testing of the site ended badly, I lost my little deposit, I still enjoyed my little return foray to Full Tilt. The software doesn’t feel noticeably different and it’s still a pleasure to play on. The games aren’t ridiculously soft but they are beatable at the low stakes.